JEFFERSON CITY, Mo. 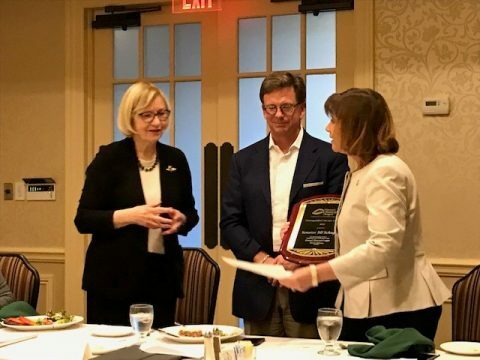 – The Missouri Municipal League is honored to present Missouri State Senator Jill Schupp with the 2018 MML Distinguished Service Award. The award honors a current or former Missouri municipal official who has made outstanding contributions to the Missouri Municipal League. The selection committee considers a candidate’s length of service, enthusiasm and dedication, participation in MML activities and outstanding leadership in the association. Sen. Schupp received the award at the October monthly meeting of the Metro Mayors of St. Louis. Jill Schupp began her commitment to public service as a member of the Creve Coeur Planning and Zoning Commission. She later served on the Ladue School Board, where she served two terms as president. Her municipal experience continued as an elected member of the Creve Coeur City Council. Senator Schupp was elected to the Missouri House of Representatives in 2008 and the Missouri Senate in 2014, where she represents the 24th Senatorial District located in St. Louis County. As a senator, she has served more than a dozen committees, boards, and councils. Her deep interest in improving the lives of children and her concern for addressing mental health issues has earned her many awards, including the St. Louis Children’s Hospital State Advocate of the Year in 2017. Sen. Schupp has been an advocate for Missouri cities in the state legislature. Her service goes well beyond her constituents in the 24th District and extends to all of us who deal with making lives better through local governance and good municipal services. Sen. Schupp has a record of sponsoring state legislation that benefits our cities.